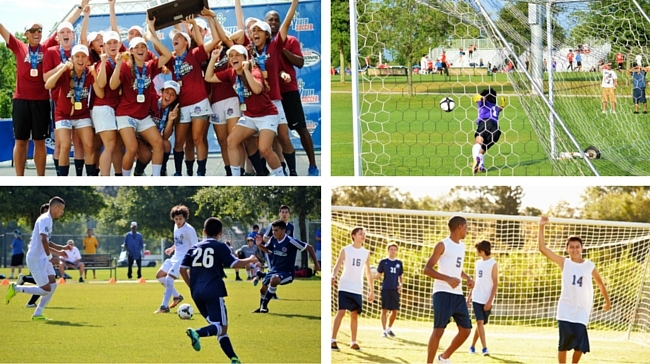 The Florida Youth Soccer Association (FYSA) strives to offer programs for players of all levels in the state of Florida. For those players who want to play in a fun and friendly environment, our recreational youth soccer teams and small-sided games are perfect. These teams focus less on the importance of winning and more on the importance of enjoying the game. For our players with mental and/or physical disabilities, our TOPSoccer program focuses on helping children aged 4-19 years develop friendships, a better self-esteem and a greater understanding of teamwork. Our TOPS coaches and volunteers help make sure their "Buddies" have the most fun possible. Players that want to achieve a higher level of play may be more suited to our competitive teams. These teams will provide them with the necessary tools and skills to excel in the sport of soccer and aid them in becoming a better player. We expect some of our players will want to continue playing soccer during their collegiate careers and possibly even on a national level. For these children, the Olympic Development Program (ODP) can provide them with the resources and training needed to reach those goals and the opportunity to gain regional and national exposure. Please be sure to check the links to the left for a view of what FYSA has to offer. If you have any questions, please contact us via email at info@fysa.com.